FOR ALL its current popularity, (recording impressive opening weekend box office figures in India), you can’t help feel the film, ‘Sachin: A Billion Dreams’ covers only one aspect of this remarkable figure’s story. The film is good on Tendulkar’s cricket career and achievements. English director James Erskine (who has several sporting films to his credits) has made essentially a cricket film – in our interview he contended his production looked at all aspects of the man – and the ups and downs. There are certainly glimpses, yes, but he doesn’t probe the little master in the way that that great West Indian bowlers of yore might have done, if Tendulkar were at the crease and offering stubborn resistance. For the most part, Tendulkar himself plays with an extremely straight bat. We never see him get animated or passionate. On his family, he is clearly sweet and smitten – his wife Anjali provides the more telling analysis at times and while Sara and Arjun don’t speak, you see a family man through and through. He is a very likeable figure, but Erskine doesn’t pose enough searching questions. Commissioned to direct the film, it’s largely a nostalgia ride for any (Indian) cricket fan. And marvellous it is too – but purely on that level. But others coming to this story from outside India and not any understanding anything of cricket might be a little underwhelmed. And that is a shame. Erskine identifies three key elements and they provide some narrative hooks – there is no voiceover – we get Sachin own’s words or the footage explains the events. Firstly, him being viewed as something of a god or a god-like figure. Secondly, what sort of the man he is behind the god like image. And lastly, Tendulkar’s story for Erskine represents India’s very own – from the shadows and margins to (near) world power status in the second decade of the 21st century. On the first element, the film does a decent job. You do get a sense of what he represents to India. But why and exactly how, are less well tackled and the last point is only very superficially covered, though at times there are promising sounds and pictures but they don’t amount to much in the end. What you have is a picture of a great cricketer, not so much how Tendulkar is one part of a new, or old, or even developing, Indian psyche. India’s economy opened up after 1991, foreign investment and Indian corporate activity had been heavily regulated but with a desperate need for foreign exchange, the then Congress Party government Finance Minister (and later PM) Dr Manmohan Singh, a much respected foreign-trained economist, lifted the Raj controls. In the same way, Tendulkar’s career began to take real shape in the 1990s and the World Cup victory in 2011, was the master blaster’s own dream come true. “The narrative point is set,” stated Erskine to www.asianculturevulture.com earlier this month from The Oval cricket ground, where this interview conducted (and before seeing the film). The World Cup victory in 2011 was a huge moment for Tendulkar and India. This icon finally achieved what had most eluded and inspired him – from 1984 (when Tendulkar was just 10) and India triumphed against the mighty West Indies much against the odds – and provided only the third World Cup (at the time) and Lord’s with one of its greatest fairy tale endings, a little bit like Leicester FC lifting the Premier League title last year in England. But with Tendulkar there was always a sense of destiny – from the moment he struck a world record partnership at schools’ level in Mumbai with Vinod Kambli (who also later played for India but faded away) to the moment, he took on feared Pakistani pacemen Wasim Akram and Waqar Younis on their home turf as a 16-year-old Test Match debutant. There is some touching home footage and the late father Tendulkar so reveres is always a presence and the role of his first coach, Ramakant Achrekar, and older brother, Ajit are well-documented and tell us something fresh. There are some nice scenes of the Tendulkar family in England – Sachin coaching his son Arjun and driving his family around the Yorkshire Dales (?) that was once his cricketing home in 1992 (to became the county’s first non-white player and one of the one very first foreign-born ones to represent Yorkshire after it relaxed its rules about taking on only Yorkshire-born players). 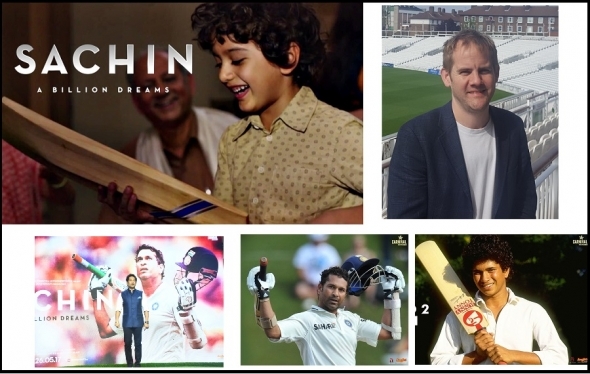 For the cricket fan, and the Indian one at that, “Sachin: A Billion Dreams” does its job, but to a wider and perhaps more objective audience, there are gaps. We don’t see enough of these, even the ones alluded to, such as the Indian captaincy controversy a second time around and the period when an abrasive figure in coach Aussie Greg Chappell took over, are sketchy and not particularly illuminating. Yes, that might have been a longer film, but perhaps less cricket and more analysis and a more probing questioner could have revealed much more of the man who remains an iconic figure and always will be, to India and to the game at a wider level. If you like Tendulkar already, you will enjoy this, if you’re not a cricket buff or much interested in India, it may drag, especially when there is quite a lot of cricket in this. ‘Sachin: A Billion Dreams’ is out worldwide now.